The Aero Peek: How To Use or Disable the Windows 7 Aero Peek Feature? Still wondering what is Aero Peek - the improved feature in Windows 7? Then, you have come to the right place. In Windows Basic, when you click the Show desktop button, it minimizes all open windows to display the desktop. In Windows Aero, when you point to the Show desktop button, all open windows appear transparent which allows you to quickly peek at the desktop. If you wish to use the Aero Peek feature, make sure your system meet the minimum requirements to run the Windows Aero desktop (the title bar of the active window is translucent when it is not maximized). Open any program (you can have many program windows open). Hover the mouse over the Aero Peek control box (Show desktop button) to view the desktop. Notices that Aero Peek displays only the outlines of open windows. Click the control box to toggle window display on and off. Right-click the Show desktop button, and then click Peek at desktop to turn it off and on. 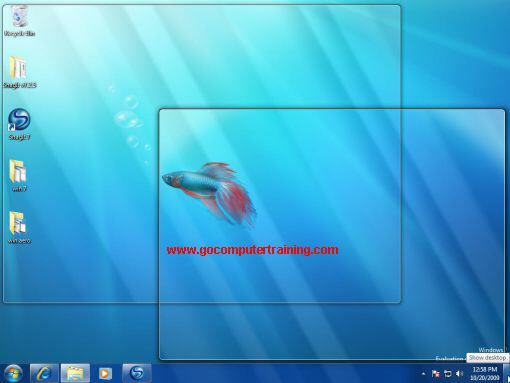 To discover the new Aero Snap feature in Windows 7, click here.